So far in the hard disk market, we can find many western digital hard drives with USB interface only. You can seldom find some data recovery tools which are able to operate on their firmware section, if such kind of hard drives are not detected due to firmware corruption, it’s hard to restore the drives and recover the data. How to work on the firmware of western digital hard drives with USB interface only? This is a common problem met by many data recovery experts even if you have good data recovery tools or even if you have USB to SATA or IDE adapters. Here we take HD Doctor suite as an example to explain how to connect USB-only western digital hard drives with HD Doctor suite. As everybody knows, HD Doctor suite is specially designed to repair firmware failures and restore hard drives, HD Doctor contains HD Doctor for Seagate, HD Doctor for WD, HD Doctor for maxtor, HD Doctor for Hitachi and HD Doctor for Samsung. Therefore, you just need to connect the USB-only WD drives to HD Doctor for WD and then you are able to handle the firmware section. Step 1 Remove the PCB from the drive. 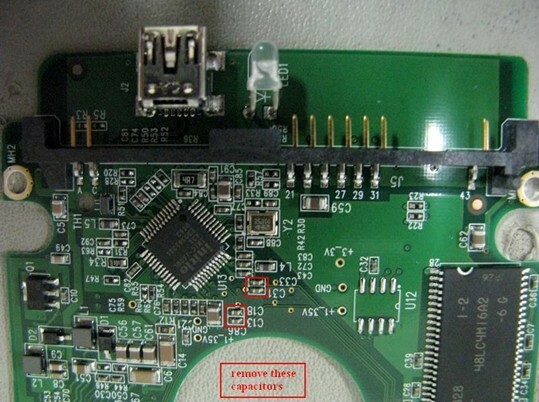 As shown in the picture above, we need to remove these 4 capacitors from the PCB carefully. It’s suggested that you can remove them with a hot air gun. 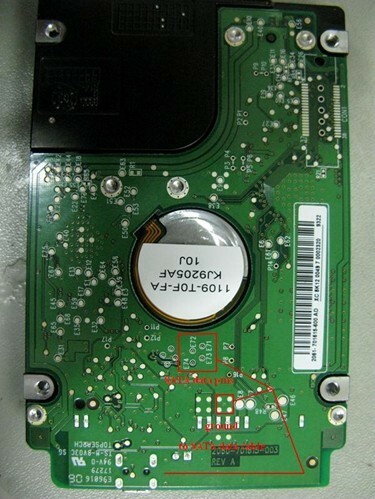 Find a SATA data transfer interface from a SATA drive. You don’t need to care about the model number, the firmware version or PCB number. Any hard drive with a SATA interface will do. 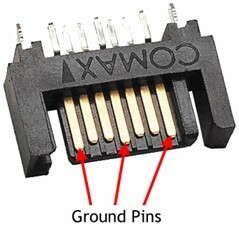 It can be told from the picture that the longest 3 pins are the ground pins, the other four pins belong to SATA data pins. We need to connect them together later. From the back side of the PCB, we can see the pins E71, E72, E73 and E74 belong t SATA data pins. And the other four pins marked with a red square belong to ground pins. Now connect each pin to their corresponding one. Ground pins to ground ones, SATA data pins to SATA data ones. After that, you can connect the SATA interface to SATA to IDE adaptor, and then the data can be transfer correctly. The USB interface also needs to be connected to your PC as the power supply. Otherwise the drive will not spin at all. Now we can diagnose or restore the WD hard drive as usual ones by handling the firmware section. Many thanks to Ann LeFlore who devoted a lot to the picture and idea of this post. 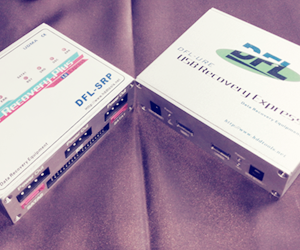 If you wish to learn more about SalvationDATA data recovery tools, please see How do you like SalvationDATA data recovery tools? Very interesting. Thanks for the tip! I see that in this example an older type if WD-drive is used, the newer ones have another SATA-to-USB bridge-chip on it, an INIC1706E, which also provides for an encryption (AES128bit). My question is if this solution totally goes around this chip, or that the chip still is used. Because if it goes around this chip, we can only access encrypted data, which might not be (easily) recoverable. Next this newer type of PCB does not give a E74, but a E75; is this the same connection? Tomorrow (with permission of the customer) I’m going to try this, and post it here if it works. Hi all, I’m a little bit confused. 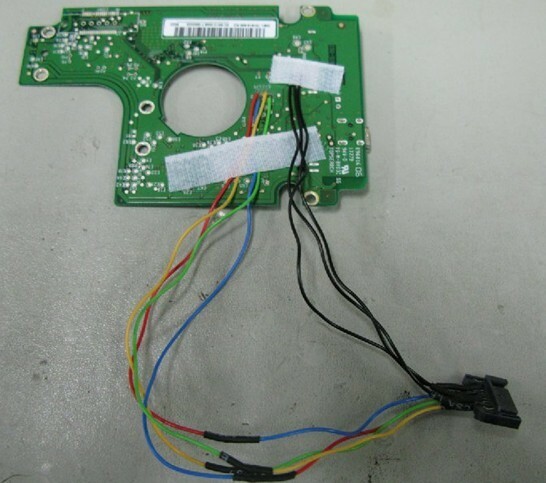 The four pins marked with a red square have to be connected with the pins 1, 4 and 7 of the SATA interface. Ok, but if we have 4 pins, and in the SATA interface there are only 3, how I have to connect the 4 ground pins exactly?. Have I to connect all ground pins? How I have to connect them? The rest I think that is clear. 71 (Tx+) with the second pin in the SATA interface. 72 (Tx-) with the third pin in the SATA interface. 73 (Rx-) with the fifth pin in the SATA interface. 75 (Rx+) with the sixth pin in the SATA interface. Where do you connect the power on this pcb? I have read this over and over and tried to gain access to the photos on Comment # 9 which are not there anymore. Can someone please tell me where I can find these please. @Matt, what’s your email i’ll send a copy to you. Hi nzo17, I also cannot get access to the pictures. I would really really appreciate any help because my 740gb wd passport is failing on me and I absolutely cannot pay $500 for data recovery. I am not experienced in this field at all but am very eager to try everything in my power to retrieve my data! This post has been tremendously helpful because there seems to be almost no easily available help on this topic elsewhere. Please help clarify further anything that you can. Thank you in advance! @ onDate: Sorry, i don’t can see your pictur. My Problem is. The HDD is as “unknow device” identified. I don’t can take a another electronic, while the rev. is not identified. How i to connect the power on the electronic? So what are those pins in the 12-pin header doing? I’ve read stuff around the web saying that you can’t connect to SATA with them– but why not? They don’t correspond to SATA pins OR USB pins? Then what are they for? Feel free to e-mail me if you have access to my address. Does anyone know how to recover the ATA password locked drives without any hardware interference? I am not a HDD specialist, especially in the hardware level, but software may do. Any thought on that one? Anyone? Great information! I have been hunting for something such as this for a time now. Cheers! What about the USB3.0 – Western Digital Passport Hard Disk Drives? Can someone please decypher the 12 pin connector on the back? Or figure out what pinpoints will provide SATA Access.